◆ Papers should be submitted in MS-Word (doc) or PDF format by website: http://mc.manuscriptcentral.com/fec. 1. 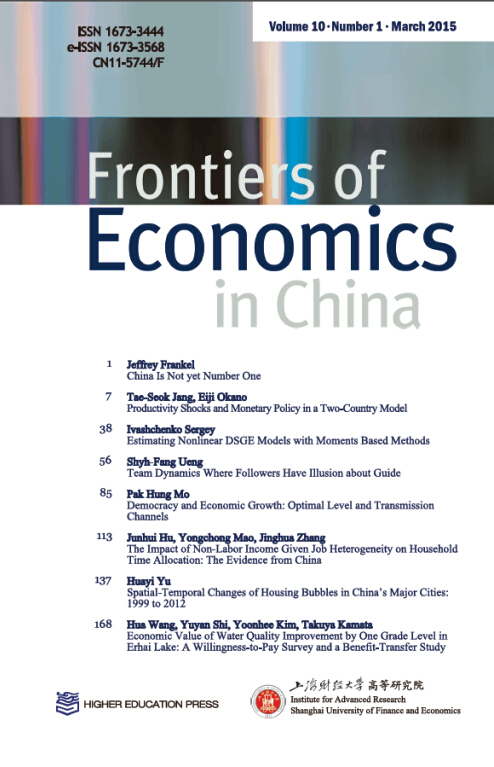 The title page should contain: (i) the title of the paper, (ii) a suggested running head (abbreviated form of the title), (iii) the full names of the authors and (iv) their positions at relevant institutions (e.g., Associate Professor at Tsinghua University), (v) the addresses of the institutions at which the work was carried out, together with (vi) the full postal and email address, plus telephone numbers, of the author to whom correspondence about the manuscript should be sent, (vii) an abstract in English of no more than 150 words, (viii) 8–12 key words, and (ix) between 4–7 JEL codes. 2. Sections should be numbered by Arabic numerals, potential subsections in the form 1, 1.1, 1.1.1, 1.2, etc. 3. Figures are to be numbered consecutively in the form Figure 1, Figure 2, etc. Preferably, the figures should be professional quality computer graphics. Figures should be captioned informatively, so that they can be understood without referring to the text. Figures must be reproducible on an appropriate scale, typically half a page to a quarter page. Legends with an unreadable small font and too thin lines must be avoided. 4. Tables are to be numbered separately from the illustrations. Each table should have a short title. Tables should contain only horizontal separators and a double horizontal bar on top. Vertical separators are not acceptable. 5. Formulas should be numbered consecutively on the right-hand side of the page in the form (1), (2), etc. 6. References in the text and in footnotes should follow the author-date format, for example (Akerlof, 1970; Arrow, 1963). References should be typed in the following format. 7. The source of financial grants and other funding must be acknowledged. The contribution of colleagues or institutions should also be acknowledged. Personal thanks and thanks to anonymous reviewers are not appropriate. Acknowledgements should be provided between the text and the references. 8. Except the above, the author needs not to do any typesetting work. We will finish the work.